The 2011 season was another hugely successful year for the club, winning three cups outright and ultimately retaining the Silver Salver and winning the League – the first Club ever to do so. Furthermore, we were pipped by Brock BC in a play-off final for the inaugural League Division 2 title. In addition, Neil McCallion (skip), Andy MacEachran, Ronnie Jardine and Andrew McCallion won their way through to represent the club in the Fours at the S.B.A. finals held at Northfield, Ayrshire. This was Neil’s second visit to Northfield in three seasons. The 2010 season was probably the most successful in the club’s long history, winning four cups outright and ultimately winning the Silver Salver. In addition, our club champion Jim Daly won the Champion of Champions and Richard O’Malley the Junior Champion of Champions. Neil McCallion (skip), Michael O’Shea and Billy Murray Jnr. won their way through to represent the club in the Triples at the S.B.A. finals held at Northfield, Ayrshire. Jim Daly was the runner-up in the Peter Denny Shield. George Lunan (skip), Charlie Cassidy, John Gillies and Billy Murray Sen. won the Raeburn Cup. Despite winning only two cups, the consistency of the club throughout the season resulted in us winning the overall Silver Salver for a remarkable third time in five years. We also had eight out of eight winners in securing the Centenary Trophy. David McCarry won the Peter Denny Shield by beating Ian McCallum in Final. 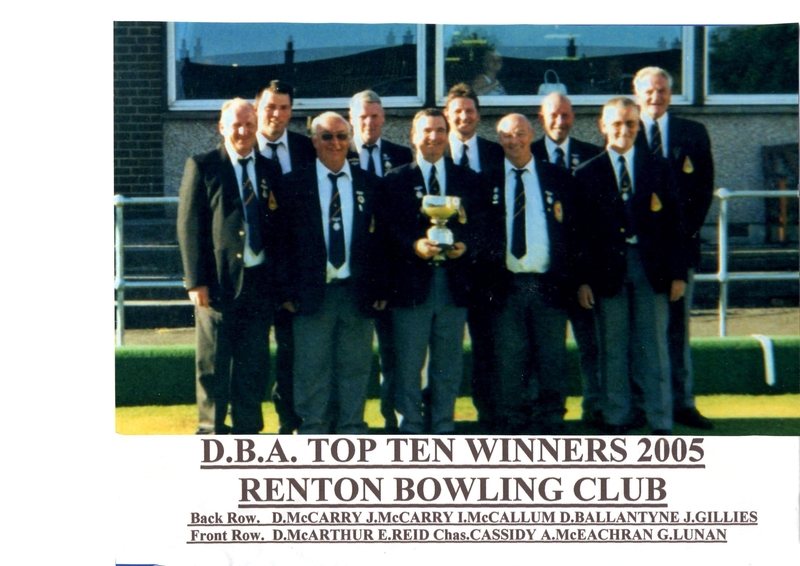 The Club won the Syd Walter Triples and the League but the most significant achievement was winning the DBA Top Ten for the second year running versus Dalmuir Bc on Renton. 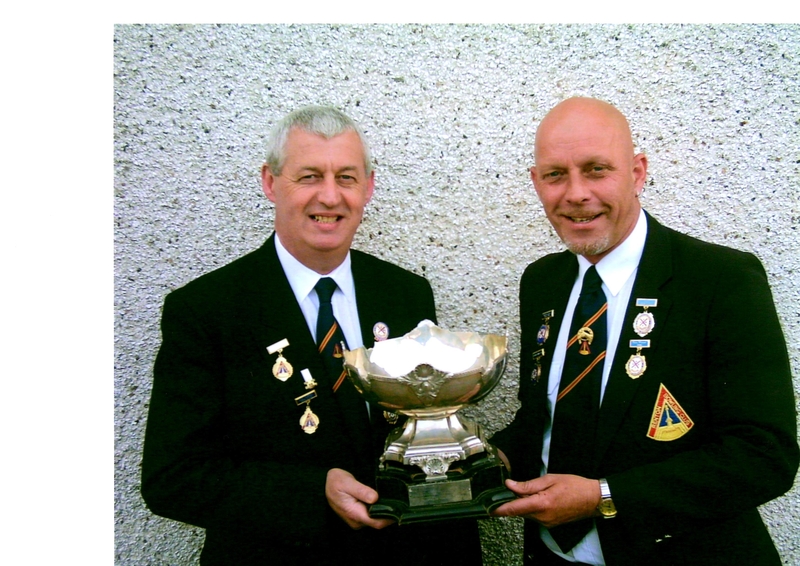 Neil McCallion (skip) , John Gillies , David McCarry and John McCarry won the Raeburn Cup. Duncan Ballantyne (skip) and Stuart Marrs also won the DBA Pairs, the first time anyone from our Club had won that trophy. 2005 was a breakthrough season for the Club in winning the DBA Top Ten for the first time in our history beating Victoria Torrance Bc at Radnor Park. In addition, Billy Murray Jnr. won the DBA Junior Singles and Ian McCallum the Peter Denny Shield. The Club also had eight winners out of eight in securing the Ballantine Shield Pairs, with our consistency over the season leading to our second Silver Salver. The Club won three cups in 2004 and David McCarry was the D.A.C. Junior Champion of Champions. David was also the runner-up in the Peter Denny Shield. 2003 was a fantastic season for the Club, winning four cups and the overall Silver Salver for the first time since 1988 (when it was then known as the Polaroid Trophy).